Novelist Stacia Pelletier, chief writer for the Office of the President, joins a diverse range of Emory faculty and staff with appearances at the Decatur Book Festival. The Decatur Book Festival returns this weekend with its annual lineup of lectures, panels, talks and signings, with hundreds of national and local authors, ranging from beloved bestsellers to new voices. The festival kicks off Friday, Sept. 1, at Emory with "Journalism in Our Current Environment," featuring a panel of renowned reporters and editors discussing the importance of journalism in a time of the 24-hour news cycle, social media-generated fake news and society’s perceptions of media today. Tickets for the event in Emory's Schwartz Center for Performing Arts have been distributed to capacity; only limited tickets for Emory students remain. Following the keynote event, the Decatur Book Festival continues Saturday, Sept. 2, and Sunday, Sept. 3, on stages throughout downtown Decatur. A range of Emory faculty, staff, students and alumni will participate, including Stacia Pelletier, who received her master’s degree from Candler School of Theology and her PhD from the Laney Graduate School and is now the newly minted chief writer for Emory President Claire E. Sterk's office. She is the author of "Accidents of Providence" (2012), which was short-listed for the Townsend Prize for Fiction, and the newly released "The Half Wives," a powerful story of love and loss in the untamed hills of 19th-century San Francisco that Kirkus Reviews called "tough to put down." Pelletier, who will join writer Lisa Wingate in a conversation called “The Lasting Impact of Family" on Sunday at 2:30 p.m., made time to discuss her new novel, her writing process and how she balances her fiction writing with her work at Emory. How have you approached portraying families or the idea of family in your novels? I don’t think of myself as any kind of expert on family dynamics. The two novels I’ve published are really about women who don’t have much of a family, who live on the fringes of traditional kinship structures. I do know that I’m interested in writing about motherhood, but I come at that interest from kind of an odd position. I’m not a mother, although last year I did become a stepmother to two girls — an amazing and humbling experience. But I’ve felt the pressure to define myself in relation to motherhood or lack thereof for quite a while, as many women do. When you’re a woman of a certain age, people ask: Do you have kids? Do you want kids? And then if you reach another certain age, people start asking: Did you ever want kids? Why didn’t you have them? They assume your time has come and gone. In "The Half Wives," you write about two women who have very different relationships to motherhood. Marilyn, Henry's wife, has lost their baby. Lucy, Henry's lover, has an eight-year old daughter. I’m curious about what the role of mother — or the absence of that role — has meant for “ordinary” women in different eras and when they reach different ages in their own journey. What counts as motherhood? Underneath that question is a more personal one about what it means to be a caregiver in a broader sense, and how caregiving intersects with finding one’s voice and with determining one’s role and responsibilities to a broader community, including environmentally. What is our duty as caregivers to the planet and to the next generation of children, even or especially those children who are not our own biological offspring? Marilyn and Lucy are both in love with the same man. What made you want to write about women in this kind of relationship dynamic? What’s there not to love about a good love triangle? Although in reality, I’m less interested in the love part of a love triangle than in what happens after the triangle breaks or comes to an end. How do people move on? When is the past the past, and when is it still hanging around, taunting us? That’s really what fascinates me. Because all around us are people who are happily married or partnered and yet, at the same time, carry these old scars from their previous lives that have made them who they are today. We don’t talk about those things in day-to-day life. The love triangle is, for me, a way to get at that larger experience. Where did the idea for "The Half Wives" come from? The idea started with a long walk through a historic cemetery in Atlanta, when I noticed a headstone for a man flanked by two women, one of whom was clearly his wife, and the other, I couldn’t tell what her relationship to the couple was. She wasn’t the daughter and she wasn’t the second wife to a widower. I began to imagine that trio of headstones telling the story a man so bound to two separate women — and therefore to two versions of himself — that he could not part from either, not even in death. The story took off from there. "The Half Wives" takes place over the span of 24 hours – what was it like writing in such a confined time frame? At first I loved it and later I hated it. I loved it because keeping things bound to a tight timeframe helped me force my characters into action: they didn’t have any time to waste! They had to get moving. I also wanted to convey a sense of urgency and pace that would keep the reader turning pages even if the story itself is moodier and more reflective than a conventional page-turner. Keeping the story bound to one day forced me to do that. But I also hated it during the revising process, because a tight time frame means that you have that much less wiggle room to introduce major changes. And determining how much back story needs to be in there to provide context without slowing down the main narrative was a challenge. But that’s the case for any novel, I think. Where do you fall on the likable vs. not likable main character debate? Do you feel it’s harder to pull off when you have a female protagonist? I dislike the whole debate, but it’s unavoidable when you’re working with a publisher trying to stay afloat, and when your editor is understandably worried about sales in an extremely competitive market. Editors like perky and peppy female heroines in their historical fiction. No getting around it. And the women in my novels, I don’t know how perky and peppy they are. They tend to do bad things, but I think there’s an audience out there for that. And yes, it’s harder with a female protagonist because we judge women more harshly for their behavior than we judge men. Right now, in the novel I’m currently writing, the main female character has been accused of a bizarre felony, and already, even before I show the draft to anyone, I’m feeling internal pressure to try to persuade the reader that she’s still a decent person, that she’s not “crazy” or “deranged.” If I were writing a male character, I don’t know that I would feel the same internal pressure. What has it been like balancing work life, writing life and personal life? And has that changed from when you first started writing? It’s been challenging. If you want to write, you have to be prepared to give something else up. I don’t know what it is, but it’s going to happen. I’m proud to be a staff member at Emory. I recently started a new position in the president’s office, and before that I spent five years in the health sciences development office. Working a full-time, demanding Emory job while trying to write novels on the side will kill any social life and free time you have. But you learn to juggle. Somehow during the course of writing these two novels I managed to meet someone, fall in love, renovate a house, get married and start learning to become a stepmother while also keeping up — or trying to keep up — with my regular workweek at Emory. But it isn’t easy, and it requires stubbornness and maybe a bit of neurosis. Feeling sorry for yourself is tempting but doesn’t help anything, and it will irritate the people around you, who understandably think there are more important things in the world to worry about than whether or not you got your writing time in that morning. How do you feel about your writing process now that you've successfully published your second novel? I’m lucky to have married someone who supports both my professional life and my writing life and who understands that my writing actually enables me to be more present and engaged in the rest of my life. I also feel fortunate to have found a community of fellow writers, extremely talented people, here on the staff at Emory. I know Emory is world-renowned for its exceptional English and creative writing programs, and I’m proud to work at an institution with those credentials. But I also want to give a shout-out to the people on the staff side, to note the depth of talent we have there as well. I have found great encouragement and support along the way from fellow writers and artists — photographers, painters and more — who hold busy day jobs as staff members across the university and in health sciences and somehow make it all work. Is there any advice you'd give to someone out there looking to write or finish a novel? My advice is to be persistent. Just keep at it. And don’t get too much input on your writing before you know what you really are working on. Emory authors will join a variety of panels at the Decatur Book Festival, as well as sign books and visit with festival attendees in the Emory tent, which is #500, located near the corner of E. Ponce de Leon and Clairemont avenues. Emory is a major sponsor of the festival, and Emory Libraries will be joined by staff from the Emory Center for Faculty Development and Excellence, Carlos Museum and the Emory Center for Ethics in the Emory tent. 11:15 a.m. – 12 p.m. – Panel discussion. "A Sense of Belonging." Marie Marquardt, scholar in residence, Candler School of Theology, discusses her novels "Dream Things True" and "The Radius of Us" with fellow authors of young adult fiction Joanne O'Sullivan ("Between Two Skies") and Lilliam Rivera ("The Education of Margot Sanchez"). Teen Stage. 12-1 p.m. – Book signing. Erin Tarver, assistant professor of philosophy, Oxford College, "THE I in TEAM: Sports Fandom and the Reproduction of Identity." Emory tent. 12:30-1:15 p.m. – Panel discussion. "Big City Maps: Using Virtual Reality to Build Fictional Worlds." Emory Center for Digital Scholarship staffers Arya Basu, Clint Fluker and Megan Slemons will join "Brotherman" comic book artist Dawud Anyabwile for the Big City Maps panel, a discussion and virtual-reality demo of their 3D team project to bring the streets of the fictional Big City to life. Marriott Conference Center C.
1-2 p.m. – Book signing. Jericho Brown, associate professor of English and creative writing, "The New Testament.” Emory tent. 2-3 p.m. – Book signing. Marie Marquardt, “The Radius of Us.” Emory tent. 3-3:45 p.m. – Reading. Benjamin Reiss, professor of English, “Wild Nights: How Taming Sleep Created Our Restless World.” Introduced by Emory science writer Quinn Eastman. Marriott Conference Center A. 3-4 p.m. – Book signing. Michael Lucker, screenwriting adjunct faculty, Film and Media Studies, “CRASH! BOOM! BANG! : How to Write Action Movies.” Emory tent. 4:15-5:30 p.m. – In conversation. Pellom McDaniels, curator of African American collections in Emory's Stuart A. Rose Manuscripts, Archives and Rare Book Library, will interview Joe Barry Carroll, a former NBA All-Star, about his new book, “Black American Voices: Shared Culture, Values and Emotions.” Marriott Conference Center C.
4:30-4:40 p.m. – Reading. Karen Garrabrant (aka Karen G), Emory senior acquisitions assistant, poet activist and slam poet extraordinaire, will read (and serve as co-host during the day) at the local poets stage at Java Monkey. Local Poetry Stage. 4:30-5:30 p.m. – Book signing. Benjamin Reiss, “Wild Nights: How Taming Sleep Created Our Restless World.” Emory tent. 4:15-5 p.m. – Panel discussion. "Audiophiles, Lend Us Your Ears!" Members of ATL Narrators, the Atlanta-based professional audiobook narrators group, offer live readings from featured DBF titles. Presenters include Janet Metzger, adjunct professor, Emory School of Law. Historic DeKalb Courthouse. 5:30-6:15 p.m. – Panel discussion. "What Would Gene Patterson Say Now?" Hank Klibanoff, professor of practice in creative writing/nonfiction and director of the Georgia Civil Rights Cold Cases Project at Emory, moderates a discussion with Poynter Institute senior scholar Roy Peter Clark, Howell Raines and Ambassador Andrew Young about how Gene Patterson, who won the 1967 Pulitzer Prize for editorial writing, would write and manage a newsroom today. First Baptist Decatur Sanctuary. 12-12:45 p.m. – In conversation. “Porter, Steward, Citizen: An African American’s Memoir of World War I.” Pellom McDaniels will discuss Royal Christian’s memoir, first published in 1919, about his extraordinary experience in Europe in 1917, with Joe Crespino, Emory's Jimmy Carter Professor of American History. Marriott Conference Center auditorium. 12:30-1:30 p.m. – Book signing. Robert J. Davis, visiting instructor, Rollins School of Public Health, “Fitter Faster: The Smart Way to Get in Shape in Just Minutes a Day.” Emory tent. 1:15-2 p.m. – Discussion. "Whose Miss Brooks? Exploring the Legacy of Gwendolyn Books." Jericho Brown and poet and author Quraysh Ali Lansana examine the life and legacy of the first black woman named U.S. poet laureate. Marriott Conference Center C.
1:30-2:30 p.m. – Book signing. Daniel LaChance, assistant professor of history, “Executing Freedom: The Cultural Life of Capital Punishment in the United States.” Emory tent. 2:30-3:15 p.m. – Panel discussion. "The Lasting Impact of Family." 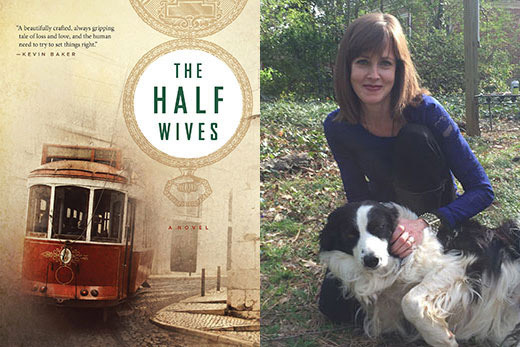 Stacia Pelletier, chief writer, Emory Office of the President, and author of “The Half Wives,” will be in conversation with bestselling author Lisa Wingate, discussing how fiction helps us understand the dynamics of family relationships. Moderated by author Sally Kilpatrick. Decatur City Hall. 2:30-3:15 p.m. – Discussion. "The End of White Christian America." Robert P. Jones, CEO of the Public Religion Institute, will be in conversation with Atlanta Journal-Constitution reporter Rosalind Bentley, introduced by Letitia M. Campbell, director of contextual education for the Laney Program in Moral Leadership at Emory's Candler School of Theology. First Baptist Decatur Sanctuary, presented by Emory's Laney Program in Moral Leadership. 2:30-3:30 p.m. – Panel discussion. "Archives: Sites of Memory, History and Reflection." Pellom McDaniels will moderate a panel that will include Randy Gue, Rose Library curator of modern political and historical collections, on why history and archives are important, and how authors use archives to write biographies. They will be joined by biographic authors Valerie Boyd and former Emory professor Lawrence Jackson. Marriott Conference Center C.
2:30-3:30 p.m. – Book signing. Anthony Martin, professor of practice, Environmental Sciences, “The Evolution Underground: Burrows, Bunkers and the Marvelous Subterranean World Beneath our Feet.” Emory tent. 3:45-4:30 p.m. ­– Reading. "Best American Poetry 2017." Jericho Brown reads with fellow poets Judson Mitcham and Natasha Trethewey, introduced by Rosemary Magee, director of Emory's Stuart A. Rose Manuscript, Archives and Rare Book Library. First Baptist Decatur Sanctuary. 3:45-4:45 p.m. – Book signing. Pellom McDaniels, "Porter, Steward, Citizen: An African American’s Memoir of World War I." Emory tent. 4:30-5:30 p.m. – Book signing. Stacia Pelletier, “The Half Wives.” Emory tent. 4:45-6 p.m. – Reading. "Poetry: Emory University." Hear from a variety of poets affiliated with Emory including Jericho Brown; Christeene Alcosiba, manager of operations and public programming for the Rose Library; Bruce Covey, senior director, Office of Technology and Bookstore Relations; Emory College students Madison Dalton and Adric Tenuta; former poetry lecturer Alice Teeter; and Emory alumnae Katherine Johnsen, Hilleary Gramling and Caroline M. Schmidt. Local Poetry Stage. 5-5:45 p.m. – Reading. Daniel LaChance reads from "Executing Freedom: The Cultural Life of Capital Punishment in the United States." Marriott Conference Center B. 5-5:45 p.m. – Reading. Anthony J. Martin reads from "The Evolution Underground: Burrows, Bunkers and the Marvelous Subterranean World Beneath Our Feet." Marriott Conference Center A. 5-5:45 p.m. – Reading. ﻿Robert J. Davis presents with "Fitter, Faster" co-author Brad Kolowich Jr. ﻿Decatur Recreation Center Studio.